You arrive just outside the entrance of the dungeon after a long and weary trek. You go to push open the iron doors, but as soon as you lay a hand upon them you hear the crumbling of rock above you. Two statuesque, bat-like creatures spring to life and dart towards you, their claws outstretched. This accursed place is guarded by gargoyles. Today we’re dusting off a fantasy staple, the gargoyle. If you somehow have never heard of a gargoyle, their unique property is that at first glance they appear to be statues that are either part of a building or a decoration of the room you are in. The gargoyle will seemingly out of nowhere come to life and strike you when you have let your guard down. That being said, they are some of the most perfect guards for a spooky castle, church, or evil lair. They are not very bright, but they take orders well enough and can discretely watch over your base of operations while not requiring any food, water, or sleep. Back into the Monster Manual, we go. Today we’re talking all about the ever-vigilant guardsmen, gargoyles! Gargoyles can actually be found in real life, well to a degree at least. They’re very commonly found on churches, castles, and other old, stone architecture. While they are impressive pieces of artwork to adorn your fancy stone building, they also serve a purpose. Gargoyles were hewn into the stone with spouts that would carry water away from these stone buildings. This was necessary as rainwater would erode the mortar between the stone walls of these buildings. Think of them as medieval gutters. For the record, not every gargoyle you’d see is necessarily a fancy-looking gutter. Some of these statues were carved simply for decoration. These statues are called grotesques. I love the look of the 3.5e gargoyle. It’s lanky, but just the right amount of terrifyingly demonic. Art by WotC. In D&D lore, gargoyles are purely creatures, so they’re probably closer to grotesques than a true real-life gargoyle. These creatures are not particularly bright, but they’re loyal to a master with superior cunning and intelligence. Common masters of gargoyles include evil magic users and demons. Gargoyles can handle simple tasks, but they handle them well. Instruct them to guard, torture, or anything else that will provide them with an avenue to harm intruders without requiring any complex decision making and your gargoyles will be extremely happy. They typically look demonic in nature, and it’s intentional. For one, it’s a great way to ward off interlopers if your statues look terrifying. Also, it checks-out with their demeanor. To quote the Monster Manual, “Gargoyles have a reputation for cruelty”. 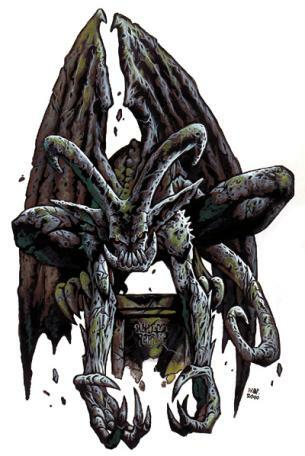 You can find the gargoyle statblock on page 140 of the Monster Manual. Gargoyles have a decent ability score spread for a CR 2 creature. Their two -2 modifiers are in Intelligence and Charisma, which are two of the least-used saving throws in the game, even less so in the early game of 5th edition. If you hadn’t guessed, the stone creature that is literally created to be a guard is very gifted defensively. 15 AC via natural armor and a +3 Constitution modifier play into their role quite nicely. They have a fair amount of damage resistances and immunities which makes their 52 HP that much more effective. Their +2 Strength modifier still allows them to dish out some ok damage, but it’s nothing particularly great. Their Dexterity and Wisdom is average. They also have a fair amount of mobility, which is unexpected for a creature made of stone. 60 flying speed and 30 ground speed is pretty damn great for a CR 2 creature. Couple this with their high defenses and you can play a bit risky to force intruders to move out of position to make any attacks against you. As expected, gargoyles have resistance to bludgeoning, piercing, and slashing damage from nonmagical weapons. Interestingly though, any type of adamantine weapons are able to cleave through their stone skin. Adamantine is a very rare metal in D&D that can make extremely sharp weapons and extra durable armor. It’s not magical, but it’s basically a step above your typical metals used for these types of equipment. Since they’re not a creature that needs to breath, and they don’t have internal organs, they are immune to poison damage and the poisoned condition. It makes sense, and it’s their best condition immunity by far due to how common it is. Exhaustion is an increasingly deadly condition, but for creatures, having immunity to it is mostly for flavor. That being said, it can get pretty nasty, so if your party has a way of imposing the exhaustion condition on a creature it’s decent. This justification is the same for their immunity to being petrified. It’s a rare condition so you won’t see a lot of mileage out of the immunity, but it’s flavorful and nice to have just in case. Their passive Perception is nothing to write home about, but at least they have darkvision! It’s also going to be tough to role-play your way out of a hostile scenario with a gargoyle since they only understand Terran. 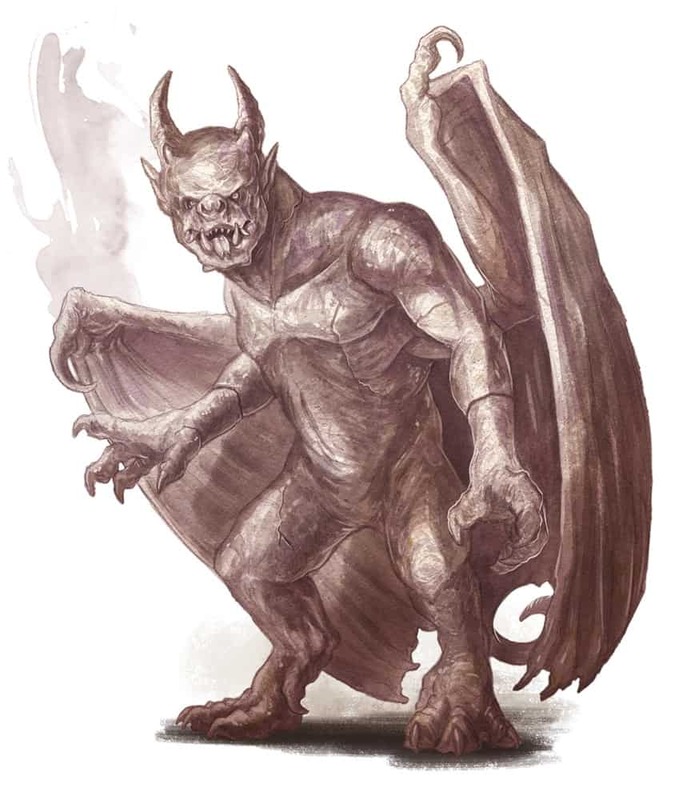 The artwork for the 5e gargoyle makes them a bit bulkier. It’s definitely closer to a traditional gargoyle. Art by WotC. True to form, False Appearance gives the gargoyle a way to appear to be a statue just like their lore and historical references would have you believe. The only catch is that the creature has to remain completely motionless. Thankfully, gargoyles can stay completely still pretty much indefinitely since they do not require food, drink, sleep, or air to live. Therefore, their best tactical decision is to use their False Appearance unless they are required to move. This is a particularly great trait to use to really screw with your players. If they’re expected gargoyles you can throw in some plain old statues and watch them freak out or waste resources to demolish the statues. A two attack Multiattack is average. 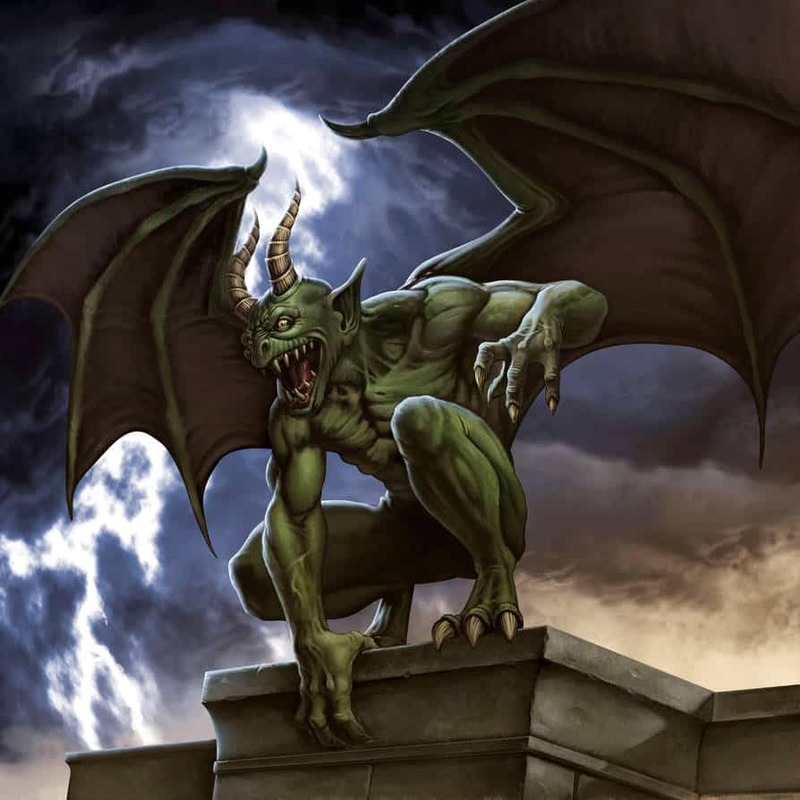 A gargoyle can deal an average of 10 damage between two attacks. These attacks are two different damage types, but it’s pretty rare to have resistance or immunity to slashing or piecing and not for piercing, slashing, and bludgeoning. For a CR 2 creature, 10 damage per round is a bit below average. It’s clear that gargoyles are not meant to be brutish damage dealers, but guardsmen that will occupy intruders until more offensively-gifted allies arrive to start dishing out damage. Gargoyles have what I’d call a solid defensive baseline. They aren’t reliant on any specific scenario to help their survivability. They have high AC for their CR and it’s natural so there aren’t a lot of ways to lower it. Their HP by itself is respectable at 52. Nonmagical bludgeoning, piercing, and slashing damage are by far the most common damage types for low-level PCs. A low-level creature with resistance to these damage types can almost double their effective HP considering how much damage they’ll be reducing during a typical combat encounter. Higher level PCs with magical weapons and items will most likely cut through gargoyles like butter. If you were to scale-up gargoyles, giving them resistance to bludgeoning, piercing, and slashing damage out-right would be the first order of business in my opinion. Poison damage and the poisoned condition are both common for magic using PCs to have access to. Immunity to both of these is solid. Gargoyles have a very solid baseline with some great perks. Gargoyles become much more lifelike when they are not using their False Appearance. Art by Albe75. Flying speed is always a noticeable perk. For one thing, it is typically unrestricted movement which can mean that the creature can either advance upon or retreat from the enemy much more efficiently. Flying speed is also an enormous perk in terms of a combat encounter. Gargoyles can swoop down from their post high up on a tower and strike an unsuspecting adventurer with ease. They can also bank on their heavy natural armor and large health pool to fly out of combat range and hide behind cover. Flight offers a lot of extra choices and variables. In battle, the side with more decisions and options is generally at an inherent advantage. Even more so when it’s at a point in the game when the party doesn’t have access to spells or items that grant them flying speed, making them sitting ducks. Flying speed at a low CR is always a very solid benefit. You probably saw this weakness from a mile away. An average of 10 damage between two attacks is mediocre even for a CR 2 creature. It would be a different story if this damage had some sort of effect tied to it. Both of their attacks are at melee range as well. They’re just two very standard melee attacks with o.k. damage. If anything, this weakness is a necessity for how strong a gargoyle’s defenses are. That being said, in actual play I tend to find that great offensive ability is much more important than strong defenses in 5e. It’s generally better to crush the other side than it is to last a lot of rounds in a fight. 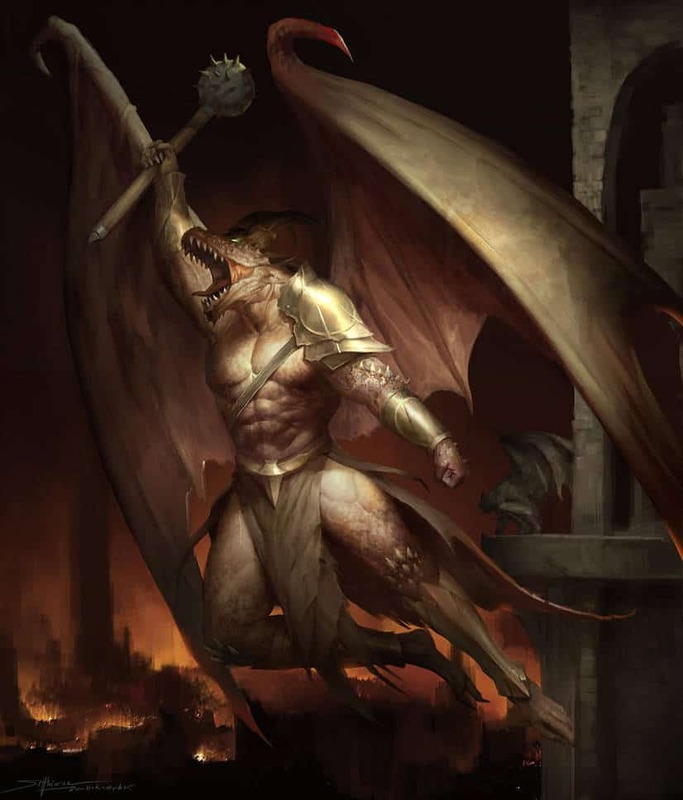 Gargoyles are basically a low-level martial character’s worst nightmare. They have flying, high AC, and resistance to basic weapon attacks. 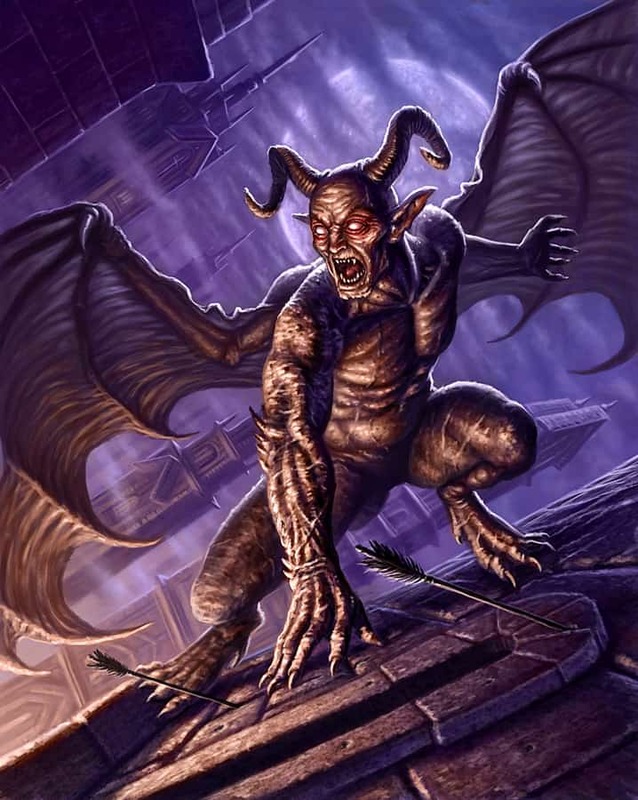 Even if you’re a ranged character you’re still going to have some difficulties dealing with a gargoyle. Magic users, on the other hand, will be able to pelt gargoyles from the sky, atop buildings, or anywhere else. They still have to deal with cover if a gargoyle hides behind a building, wall, or structure, but at least they’ll be reliably dealing their full damage. Gargoyles aren’t immune to a lot of early game conditions like blindness, incapacitated, or dazed (among other 1st and 2nd level conditions) which can leave them open to being crowd controlled if they’re not careful. On top of that, a lot of these conditions require a Wisdom save which with a +0 modifier is a literal roll of the dice to see if you’ve passed the saving throw. Unless your magic user is strictly using poison damage spells they’re going to be the bane of a gargoyle’s existence. Gargoyles come in many different shapes, sizes, and appearances. Art by TheRafa. By staying completely still and making good use of False Appearance, your gargoyles can bide their time until the ideal opportunity presents itself. This trait gives gargoyles a way to offset their low damage output by picking their battles. Let’s put it this way, the gargoyles’ master will have told them to guard a specific location. This could be the entrance of the dungeon or an important room. Their instructions could even be to guard a specific item or creature within the room, but regardless, they are confined to a location until they are given different instructions. Once the party of unsuspecting adventurers enters the room, the clock begins to tick for the gargoyles. False Appearance will make the gargoyles indistinguishable from a statue, so they’re safe. However, the party will eventually move past the room. As soon as a great opening presents itself, your gargoyles need to strike. Perhaps through a surprise round if they can muster it. These openings could be the party planning their next steps together, inspecting the building or furniture, or even when they try to take a short rest. Due to their excellent natural defenses and flying speed, gargoyles are great fighters in large spaces. They could swoop down from the rooftops of a castle or church, or pop out from a crevice within the room to flank the unsuspecting party. Gargoyles have a lot of maneuverability with their 60 ft. of flying speed. They can swoop at a nearby victim, make their two attacks, and then fly behind some cover. With their high AC, HP, and damage resistances, gargoyles can afford to risk their target making an opportunity attack against them if it means that they’ll be able to take cover. Cover can either give your gargoyles a bit of an AC boost or flat-out not allow ranged characters to target them. This minimalizes the impact that magic-users can have on your gargoyles and makes them last a bit longer in the fight. Large spaces are great, but an ideal space has a lot of outcroppings, walls, and other forms of cover that your gargoyles can temporarily hide behind. Use cover to your advantage! Art by R-Valle. A small group of gargoyles is probably not going to deal enough damage to TPK a party by themselves. That’s not where their strengths lie as a creature. They’re basically made to eat damage to either buy time for their allies to arrive, or to simply wear-down the party and force them to expend resources; making the party an easier kill for their master. But, they’re damn good at that considering how much damage they can soak. The party is going to have to make a choice each time they are in a combat encounter against your gargoyles. Will they expend valuable class resources and spell slots to drop the gargoyles quickly, or will they duke it out and take a fair amount of chip damage? Either way, your stone guardians have achieved their purpose. Gargoyles are pretty basic. They don’t have a lot of interesting mechanics to play around with, but they’re pretty well-made thematically speaking. They’re fun guards to use if you want to play mind games with your players. Halfway through the dungeon delve they’ll be sure to question and inspect every stone statue. They’re great creatures to use to slowly chip away at the party’s resources before they meet the master of the gargoyles. If they somehow manage to take-down their intruders they can always drag them down to the dungeon for torturing, or they could present their prisoners to the master of the dungeon. In my opinion, they’re a fun, defense-minded creature that does what they are built to do well. Simple tasks that seek to cause harm to sentient creatures. Also, I’m just a sucker for gargoyle artwork.